September arrives and Summer’s carefree and lighthearted energy begins to wane as the deeper energy of Autumn begins. Already the days grow shorter and the darkness gains prominence as the light begins to ebb. September is a transitional month and begins a new energy phase. It hosts the zodiac signs of Virgo and Libra, which represent great energies to use during this time. Organizing, making detailed plans about health and well-being, finding a balance between what serves and what needs to go as well as tackling indecisions can be achieved with much success during this time. As we find ourselves stepping away from the scurry of Eclipses and Retrograde Planets that influenced us over the Summer, we may find ourselves weighing our gains and losses – much like our Ancestors who were harvesting – by separating the good harvest from that which didn’t make the cut. We too, can choose this transition to happen in our lives because we actually have Mother Nature as a strong influence now! Sap is moving downwards into the earth for trees and plants, making them stronger as their roots grow deeper. This is root energy time and as the season transitions we too can use this season to go inward and connect with the roots of our very being – and acknowledge our strength and wisdom within. The pure alchemy of Nature prepping herself to gracefully face death while offering the brightest, most breathtaking colors we see in Fall’s foliage is a reminder – to let go of what needs to be let go and embrace the beauty in release. Yet sometimes, we ourselves do not go through this transition as we continue to make excuses or settling with what we have, even if we are not truly happy or satisfied. Our primal instincts during this time may shift as well. We may find ourselves wanting to “settle down” a little bit, away from Summer parties and activities. We also may wish to bring those we love closer into our personal circle as we start to plan the rest of the year’s holiday parties and gatherings. Where the Summer months tend to be more outgoing, we are now starting to enter the period of “in” going, so it’s truly important to choose the special people you want around you for the next 6 months and not settle for those that do not make you feel good or support your life. Mid-month, we celebrate the Autumn Equinox (Saturday, September 22), a supreme time for calling in sturdy balance. Mabon, which begins on Friday, September 21, is the second and next to last Celtic Harvest Festival. Some say it’s the time of the Witches’ Thanksgiving. Neo-Pagan’s celebrate the tale of son Mabon and his mother, Modron. It is a tale similar to Demeter and Persephone where Mabon was taken from Madron and hidden in the underworld. Again we have the metaphor of the time of going inward for strength and inner development. We had a chance to visit the Mother’s Well in Cornwall over our Summer vacation. The Madron Well we visited is also known as the “Modron” Well (Celtic) or Mother’s Well. 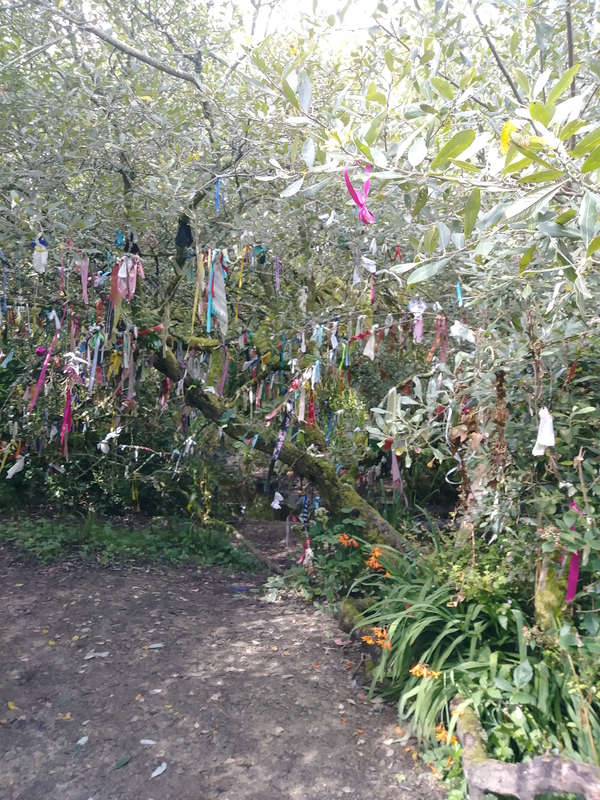 People often tie ribbons to trees that surround these healing wells that represent wishes and prayers for healing. Virgo governs the nervous system and how the brain communicates with the body, so it is important to be conscious of your inner voice and how it talks to your body. It also rules the intestines so watch your stress and anxiety and find ways to balance it with some calm and soothing rituals. Meditation, Reiki, Yoga, long walks, a warm candlelit bath, an earlier bedtime are all great healing modalities. Libra rules how we hold our body, mind & spirit in balance as well as the lower back area. In some modalities, including Chinese Medicine, the lower back can represent support (or lack of) from family and others as well as how we deal with our finances. If you tend to feel a lower back pain or “pinch,” spend some time reflecting on where you feel you may be lacking in the money department. Are you knee deep in bills? Do you spend money on useless purchases? Are you always finding yourself picking up the bar tab for others? Use this time to re-set some financial priorities. Learn to say, “no,” or “not this time,” and do not apologize for it. Likewise, for not receiving the support you desire. If you feel overwhelmed because you are helping others get back on their feet but the results just don’t seem to happen in the way you’d wish, spend more time meditating on why you offered your help in the first place and not on the disappointment you may feel about it. Its all about balancing those Libra scales! Use those Virgo attributes of analyzing and discrimination to find that level ground. Its important to remember to balance duty and obligation with some merriment and fun! Walk mindfully in the woodlands thinking of all you have to be grateful for. Scatter offerings of seeds or water in gratitude for the earth’s bounty. Find a tree that calls to you and sit with your back against it. Consider what you would send down to its roots to gain strength and be nourished through the winter. Choose a few leaves to bring back an decorate your home. Plant bulbs which will hide in the earth until early Spring beckons. Make each one a hope, idea or aspiration for Spring and wait until their little green noses show above ground – to remind you. If we move with the energy of the Wheel of the Year we can stay connected to the natural rhythms of earth’s cycles. It’s important to recognize our part in working with this energy and appreciate the bounty this harvest yields to us. August gets its name from the Latin adjective, “augustus.” Augustus literally means, ‘might,’ ‘great,’ and ‘magnificent’ – all the traits that people born under the astrology signs of Leo and Virgo display! Yet, August also ushers in the Neopagan holiday known as Lughnasadh, or Lammas. Despite that most of us are planning vacations during this month (us too at AHA! ), Lammas is honored as the time that kicks off the first of three “harvest periods.” We tend to think that the harvest time is saved for the Thanksgiving holiday here in the U.S., but the Celts thought differently way back when! Gaelic and Celtic folk celebrated September 21 and October 31 as the second and final harvest cycle – almost a month before Thanksgiving! Does it need some weeding? Do we cut back some branches or flowers to encourage more growth? Or do we pull the root out entirely? Remember, you can also give thanks to hard lessons learned or to a change in the path that you might had felt was wrong – too late. Either way, our manifestations come from within and to believe in our “seeds” or wishes, whether they are successful or not is always a reason to give thanks. It’s also a great time to give thanks to the earth and to pay respect to Gaia. She is the earth mother who nourishes us through the abundance of plants, veggies and grains. We tend to take things for granted as we no longer live like the Celts – we do not spend all our time harvesting and tending to crops in order to feed ourselves. Yet, Gaia continuously harvests for us, offering nourishment in so many forms. Spend some time thinking about how you could be of service to the Earth. Industry and intensive farming are destroying the environment as our sacred oceans are becoming filled more and more with plastic bottles and garbage. Just a simple act of recycling could help. Try and incorporate a certain mindfulness about it. How about supporting a local organic farmer by adhering a Farm to Table cycle? Some usual rituals to honor the energies of Lammas can be time consuming or a bit difficult – from crafting corn dollies to baking bread. The act of baking bread is to give thanks to what the annual harvest produced. Of course, up here in the Northern Hemisphere, the thought of baking bread during the hot summer may not seem so appealing! So another way to give thanks is to bring some yellow or orange flowers into the home, as well as lighting a yellow candle anointed with a drop of sunflower oil. We are still in the middle of Eclipse Season as well as a couple of planetary retrogrades! Have you been feeling a tremendous shift in attitude lately? Can you see a connection between what you wished for in February and how it might have manifested now? Are you finding yourself inspired to start something crazy? New? In July, we experienced very strong Eclipses that spearheaded an energy that helped us move into great changes. The final Eclipse this season happens on August 11, 2018 at 5:58am EDT. This Solar Eclipse in Leo, is one final shot at “reaching for the stars,” so make sure to do some wish-casting before 6am on this day because very soon after, our energies will be quickly shifting once again as the end nears for many retrograde planets. We will start to feel more balanced, finally! August is considered ‘getaway’ time as most rush to get in some form of vacation. People tend to dial down, business offices fully enjoy summer hours and the bustle of life tends to stand still – it seems like nothing majorly important is implemented during this time. Because the Mars and Mercury Retrograde during the Leo/Virgo time is upon us, it is not a good time to start or begin anything but it is a great time to plan and organize for it. Leo is the grand dreamer and Virgo is the ‘organizer’ or the one that gets things done. If you are still itching to do something big during August – you must wait. The last week of August is the best time to implement any big changes; September, even better. Our Facebook page has received more likes and that means the world to us! So a big “thank you,” goes out to our supporters! AHA will be doing a Sacred Journey in August so be sure to check our Facebook and Instagram pages for updates! Have a wonderful rest of the Summer and we’ll see you in September. At July’s arrival, we find ourselves in the sultry days of summer! We tend to experience happier, calmer times when connecting to nature or traveling to the shores and swimming in bodies of water. We experience the summer evenings lasting a bit longer with illuminating stars and an abundance of fireflies. This is because July brings feelings of abundance, the sweet bloom of life and dare I say – a little more confident – You! Berries and veggies are ripening on the vines and plump with the promise of fulfillment. Our gardens are beginning to offer up the literal fruits of our labors. We arrive at the so called “Dog Days of Summer” which traditionally are the 40 days beginning July 3 and ending August 11. The timing and name is no coincidence as this time of the year coincides with the morning rise of the Dog Star, Sirius. It is also the month of astrological signs Cancer and Leo, marking a time when we finally come out of our shells and into the spotlight (or sun). Gather 7 dimes (7 is Yemaya’s sacred number) and a slice of ripe watermelon and bring to a beach. Sit and watch the waves for a little bit, thinking about what you would like to improve in your life as well as give thanks for. When you are ready, stand up and rub the slice of watermelon on your feet while holding the dimes in one of your hands. Walk towards the ocean but make sure to approach the sea with respect. It is bad luck to “charge” the water when working with Yemaya. What most do is this – when they are ready to walk into the water to drop their dimes, they turn so that they are walking into the water sideways. Once you have the ocean touching your watermelon-ed toes and feet, you can turn to face the sea directly. Now you can toss your coins into the Ocean. If you have more time, fully submerge yourself and make an offering to Yemaya with a special crystal like mother of pearl, pearls, larimar, turquoise, moonstone or a clear quartz. Make sure to take it easy and not only embrace the summer slow-down but enjoy doing nothing! The New Moon on July 12 is also a Solar Eclipse in Cancer. This is a very self-nurturing influence, so take the opportunity to work with this energy and be kind and generous… to you. Cancer rules the stomach, sinuses, body fluids, and breasts. Pay extra attention to these parts of the body around the time of this New Moon. As the jasmine flower is governed by the Moon—the planetary ruler of Cancer—enjoying its aroma can help support the energy of this New Moon. Jasmine arouses our ability to connect to the divine feminine within us. Sprinkle a few drops in a bath and soak in its feminine power. Astrologically, we have 6 planets retrograde (with one – Jupiter in Scorpio – turning direct on July 10th) as well as the 2 Eclipses in July. Eclipse season is a good time for completing shadow work. The best way to work with this energy is to slow down; meditate, be reflective, journal and think about where we may be blocked or stuck. It is there, where the residual energies we carry, need to be broken down now that it has fulfilled its purpose so that it can be revitalized and re-purposed in a new way (especially during the week of July 9 – July 16). Face old fears, and try not to avoid them. Be bold and walk right into them because only then will you learn to understand what fuels insecurities and flawed belief systems. After July 16 and through the Lunar Eclipse of July 27th, we can secure a more positive energy surrounding our old beliefs and conditions, thus allowing them to transform. Those of us who face our shadows and deepest wounds will be rewarded. The Lunar Eclipse is in Aquarius and is often called the Blessing Moon but it is not only about the blessings we wish to receive but the gratitude we have for all the blessings currently working in our lives. We at AHA are extremely grateful for all of you, too! And to show our appreciation, we will be offering remote Reiki and Healing requests during these Eclipse times. Check the AHA Facebook and Instagram pages for more details! Isn’t it surprising? We have completed the first 6 months of the dynamic year, 2018! The month of June offers us the support we need to secure the changes we wish to make in our lives, as well as lifting our hearts with hope during the Midsummer time. The Irish Faery Queen Aine is the Goddess of love, fertility, wealth and the Season of Summer. Her presence can be felt every time we take a walk in a park during the warm Summer evenings and spy fireflies at dusk. Aine is also a messenger for Mother Earth and her message is this: enjoy but be responsible – respect the cycles of life and do your part to keep Mother Earth healthy. And remember, anything can help; recycle more, collect rain water instead of using tap, compost or just be conscious of what we purchase, use and disregard. During the hot Summer months, we find ourselves stripping. We strip layers of clothing as our appetite craves lighter meals and cooler drinks. It’s like we are preparing ourselves to soar above the Earth with less, as we strip away the things that no longer serve us. As we near another Festival (Aug. 1st) which celebrates our annual achievements that were dreamt up during Imbolc (February 1), naturally and during the month of June – after the wonderment of Mother Earth coming back to life with greenery, flowers and bees – we too, seem to return to personal goals that we wish to wrap up. During the Summer Solstice (the longest day and the shortest night of the year), there is a calling to check in with our “fulfillments,” or wishes and promises we made with ourselves in the beginning of the year. The Summer Solstice, being a supreme time of balance, may surprise you. Maybe your goals and dreams have changed completely over the last few months! That’s ok because it’s all part of the clearing and stripping away process. Midsummer is also known as Litha, a time where large bonfires blazed through the night as Celts praised the Sun for growing large and warm. During this month, some of us may be celebrating, while some may have joyful experiences. Some may still be shaking their heads saying, “I still don’t get all this cosmic mumbo jumbo!” Remember – everyone’s journey is different. There’s still time to manifest something amazing! And this is why you might feel a surge of Gemini energy that inspires you to kick your goals into high gear during this month so that you can feel accomplished during a Summer break. June is also considered “lucky” for marriages and commitments. Want a new love in your life? Go outside during the Summer Solstice and place a broom on the ground. Take a few steps back from the broom. Close your eyes and image your heart filling up with love for yourself. Stand there a couple of minutes grounding this loving energy. When you feel the time is right, open your eyes and take a running leap and jump over the broom. It has been said that those who jump the broom will meet the “love of their life,” and though it may not happen overnight, the love of your life will eventually find you. Another fun ritual to do is to share some mead. June’s Moon has many different names but two are most popular: Honey Moon and Strawberry Moon. The totem medicine of bees always represent “work” and advancement. So drink a little mead to gain a job promotion or to usher a successful career change. Strawberries are sacred to love in general, so make sure to serve some fresh strawberries with chilled mead. Lastly, June is the month of the Faery. It is said that the Faeries come out to play during the month of June and some have such a good time that they forget to hide when humans are watching – so you might get lucky! When it comes to Faeries, it’s better to feel their presence than to actually see one. If you are outside and feel the presence of a Faery, make sure to leave a shiny coin for them. Many people tend to picture Fairies looking like one of the most famous Faeries of all – Tinkerbell. But only a small handful of Faeries look that way and most look completely opposite. Some look more like gnomes! And they will let you know when they don’t like you! It’s always best to be respectful when treading in nature where most Faeries reside. If you are walking in nature and are hit with a deep fragrance of flowers, grass or plant life, know it is a Faery trying to get your attention. The Faery probably wants to wish you well as you take another 6 month trip around the sun and that is something to celebrate!